If you’ve been following Policy Watch’s continuing coverage of the push to outlaw so-called “conversion therapy” for LGBTQ youth in North Carolina, you may want to mark your calendars for an event in Durham this week. 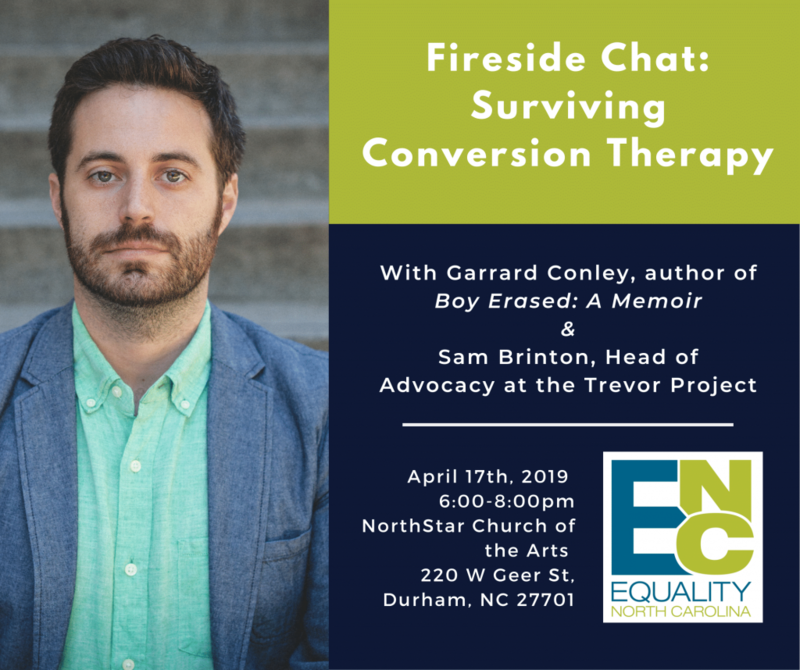 LGBTQ advocacy group Equality NC is putting on a conversation with Garrard Conley, author of the best-selling “Boy Erased: A Memoir” and Sam Brinton, Head of Advocacy for the Trevor Project. Conley’s 2016 memoir of surviving conversion therapy was adapted for the big screen last year. The film, directed by Joel Edgerton, stars Lucas Hedges, Nicole Kidman and Russell Crowe. It was nominated for two Golden Globe awards. Conversion therapy has been outlawed in 16 states and Washington, D.C. A recent poll shows overwhelming bipartisan support for outlawing it in North Carolina. Mapping “conversion therapy” laws in the U.S. Conversion therapy is so idiotic. When each of us was being created in our mother’s wombs, we all got specific genes, chromosomes, DNA, whatever it took to make each individual human being. My “chemistry” made me a heterosexual woman. Another person’s chemistry made them a homosexual man or woman. Those combinations cannot be changed or converted! It’s how we were created! Do you think you could actually change me to gay? Then why do you think we can change a gay person to straight? This is not exactly rocket science, folks. How we were created is the way we will be for the rest of our lives!